I thank all my blogger friends for there valuable comments and beautiful wishes. Eid is always a special occasion for celebrating the joy, love, warmth and togetherness. As being the elder daughter and elder daughter-in-law my Eid is much more special. Balancing between these two roles I had a memorable Eid. My mom made this Sheer korma or Sheer Khurma. It is a festival and traditional vermicelli pudding prepared on Eid ul-Fitr. It is a traditional breakfast, and a dessert for celebrations. This special dish is served on the morning of Eid day in the family after the Eid prayers as breakfast, and throughout the day to all the visiting guests. Heat ghee in a heavy-bottomed pan, lower the fire, put in the vermicelli and fry to a light golden colour and set aside. Now add almonds, pistachios and chironji to the pan and fry them to the nice golden brown color and set aside. Now pour water in the pan and when the water starts to boil add fried vermicelli and cardamom powder to it. In a few minutes the vermicelli would become soft. Now add sugar and simmer for another few more minutes. Pour milk and cook for three more miutes. Cut blanched almonds and pistachios into fine slivers and add along with chironji. 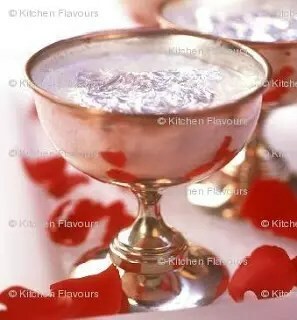 Garnish with silver varak and serve hot or cold. Last but not least add your ‘love’ to make the dish ‘YUMMY’. * NOTE: Charoli is also known as Chironji. Charoli is tiny and resembles a small bean. It tastes sweetish, and almost musky but not really nutty. Used primarily as a garnish.Charoli is a type of dry food. It’s look lightish brown in colour. Charoli is to be soaked in luke warm water for an hour and then drain of the water and place it on a dry towel and gently rub to get off the skin. Dry and keep in an air tight container for future use. looks fantastic…I used to have this during every id at my friend’s place in India..I love it!! Simply delicious,happy to have you back.Hope u enjoyed the little vacation. Looks great! esp the cup. loved it. Glad u had a gr8 Eid. Thank You Hari Priya, Sowmya, Curry Leaf, Praneetha and Anu Divya. Hope u had an excellent Eid.Celebrating eid with our parents is just great! I just posted Shahi Korma recipe:),its not sweet though. The sheer korma looks divine in those lovely glasses. wow, looks so delicious. beautiful bowl. Yum. I’ve got to try this with almond milk sometime. nice presentation….Sheer korma looks yum. It looks so pretty, just the way I like to be entertained. The presentation absolutely beautiful! Thank You Yasmeen, Uma, Deesha and Sireesha. Wow adding almond milk, i too must try it Vaishali. Thank You Hetal, Nazarina and Vandana.